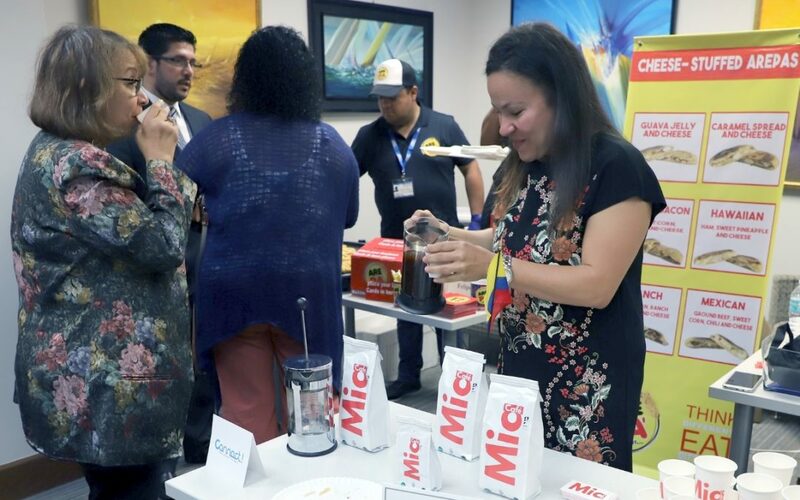 At the International Trade Hub at Port Manatee’s business development tour Aug. 23 event in Bradenton, Janna Strusberg Perdoma serves Café Mia beverages from Colombia while representatives of another Colombian company offer traditional arepa pastries. PALMETTO, Florida – The International Trade Hub at Port Manatee’s three-city business development tour has proven so successful that future similar events already are being planned. “Local and global entrepreneurs alike have been energized by this dynamic series of connective events and the vast opportunities for expanding international trade horizons,” Port Manatee Executive Director Carlos Buqueras said following the five days of functions, which included expo-style showcases Aug. 21 in Fort Lauderdale, Aug. 22 in North Port and Aug. 23 in Bradenton, as well as Aug. 24-25 visits to farmers markets, food stores and college campus sites in Manatee and Sarasota counties. Manatee County Port Authority Chairwoman Vanessa Baugh, who opened the Aug. 23 showcase held at the Connect Bradenton workspace, said officials of the port and its trade hub are continuing their work to assist participating companies in capitalizing upon the hundreds of commercial connections established during the multiple business-to-business events. “We are enthusiastically supportive of the initiatives of the International Trade Hub at Port Manatee as an invaluable catalyst for introducing companies from throughout the world to the business-friendly environment of greater Manatee County and Southwest Florida and in helping our region’s entrepreneurs make the most of productive global links,” Baugh said. Participants in the tour ranged from Colombia-based sellers of gourmet coffees and arepas – iconic beverages and pastries of northwestern South America – to a Palmetto, Florida-based firm looking to import tropical fruit products. The August outreach events build upon momentum gained through numerous visits to Port Manatee by high-level government and trade officials of such diverse nations as Argentina, Canada, Chile, Colombia, Costa Rica, Dominican Republic, Ecuador, El Salvador, Germany, Guatemala, Honduras, Japan, Mexico, Peru, Poland and Spain. The International Trade Hub at Port Manatee, founded in 2014, serves as a vital link between markets in Florida and throughout the world. The hub provides expert advice and support tools to local and global firms, assisting them with production, distribution and related activities, including development of innovative supply chain solutions.